A few weeks ago, you and I had a little sit down discussion. Actually, it was more of a confessional really. We talked about how some people feel an overwhelming desire to stock up on little bottles of spices, bags of beans, sachets of seeds and dozens of jars of potent, fermented sauces. Well, we talked about mebuying an excessive amount of random ingredients/condiments. Ok, I talked about me. Having too many ingredients. To illustrate, on New Year’s Eve, we had a couple friends over to the house. Someone opened the freezer to grab some ice and the whole group erupted into commentary on how amazingly well stocked the freezer is. Rows of tape-labeled containers, filled with chili and soup, roasted vegetables, cooked brown rice and chicken bones for stock. Sharpie-labeled bags of whole grains and flours, flax seeds, hemp seeds, and chia seeds for baking, smoothies, and morning porridges. Stale bread for crumbs, frozen egg yolks and lemon juice, lemongrass and galangal, and dozens of other odds and ends. While it’s very nice to have a plentiful pantry and freezer full of meals, it’s actually come to the point where I can’t cook any new dishes unless they use up things in the freezer or refrigerator. It’s time for a massive detox! A pantry purge! Spring cleaning! Wait, spring is still 67 days and 21 hours away. 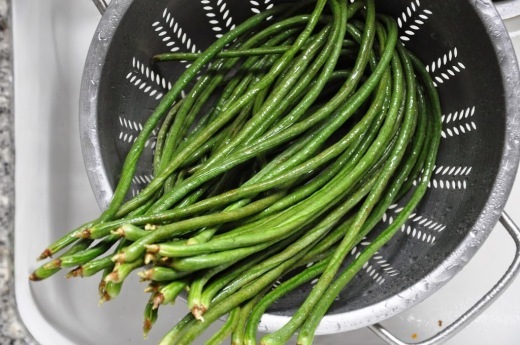 These long beans, also called Chinese long beans, yardlong beans or snake beans, are really impressive looking and are just as easy and delicious as fresh green beans. I roasted them until shriveled, sweet and tender. Meanwhile I grabbed a bunch of stuff from the fridge, freezer and spice cabinet to spice up the beans. I found some toasted coconut and hemp seeds in the freezer, a sheet of nori leftover from sushi night in the miscellaneous drawer, a humongous bag of Korean chile powder in the back of a cupboard and some black and white sesame seeds. I blended it all into a Japanese-style chile seasoning blend called shichimi tōgarashi, traditionally made with orange peel and ginger. 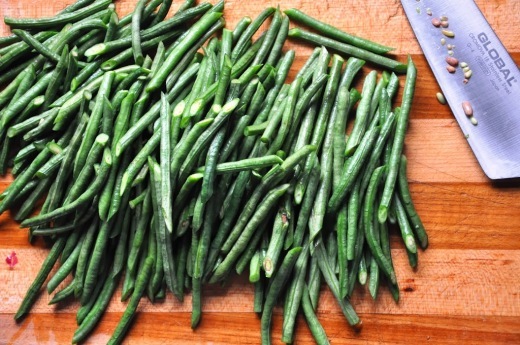 The beans were spicy, nutty, sweet and savory. They were good cold for lunch the next day too; there wasn’t even any leftovers for the freezer. 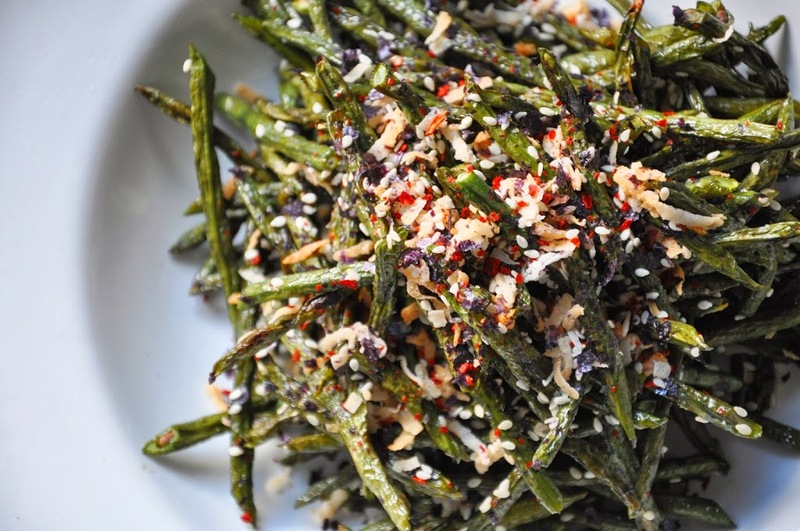 Use the tōgarashi recipe as a template; try different chile flakes, ground spices, black pepper, toasted nuts, or whatever else suits your fancy. Make the tōgarashi. 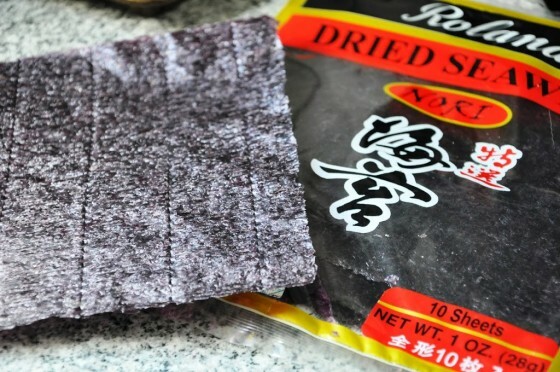 Over an open flame or grill, lightly toasted the nori until it is fragrant and crispy (but not browned); alternatively, broil the nori in the oven. 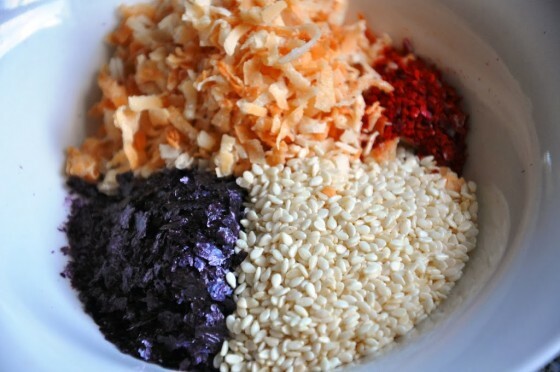 Crumble into small flakes and mix with the coconut, sesame seeds and red pepper flakes. Use immediately or store in an airtight container for up to 2 months. Roast the beans. Preheat an oven to 400°F. 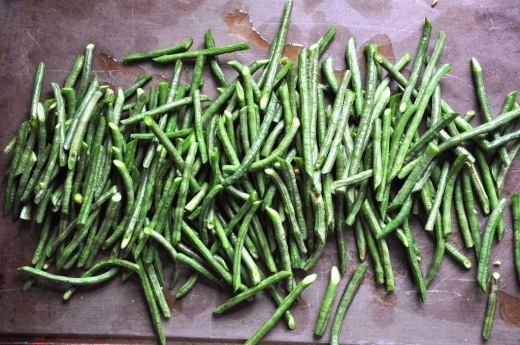 Cut the beans on the bias into 2-inch lengths and toss with the olive oil and salt on a baking sheet. 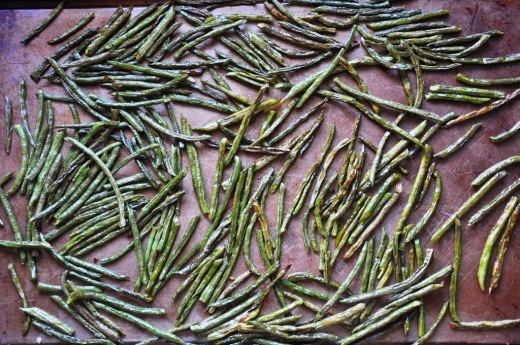 Roast for 20-25 minutes, until wrinkly and well browned (but not burnt). Drizzle with sesame oil and sprinkle with plenty of the coconut tōgarashi.